•Rock-surfaced sites with concrete leveling pad. •Water hookups at each site. •​Table & Grill at each site. 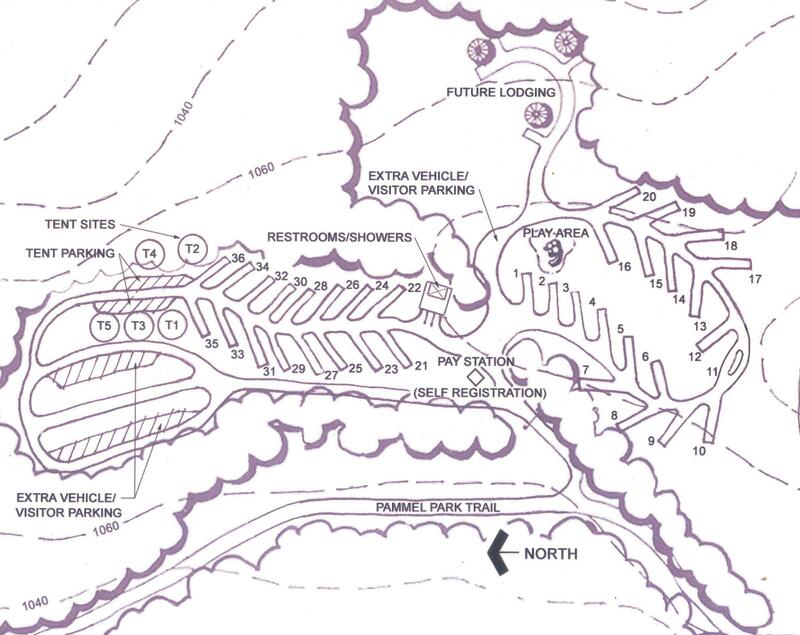 To view a campground map, click here. For more information on Madison County Parks visit our website at www.madisoncountyparks.org. Pammel Park is located 4 miles southwest of Winterset. Modern camping facilities are located on the Backbone. Directions: From Winterset travel west on State Highway 92 for 1 mile, turn south on County Highway P68 for 3 miles. Directions: From Winterset travel west on State Highway 92 for 1 mile, turn south on County Highway P68 for 3 miles. This main entrance requires that you travel through a tunnel with a 12′ 6″ clearance and a fairly tight turn on the east end of the tunnel. If your camper is too tall for this clearance, see Alternate Directions to Avoid Tunnel. Alternate Directions To Avoid Tunnel: From Winterset travel south on U.S. Highway 169 for 1.75 miles, turn west on Carver Trail for 2.5 miles, turn north on Pammel Park Trail for .5 miles to enter the South gates of Pammel Park. Early April-October (pending on weather). Operating Hours: 7:00 am-10:00 pm (closes at dusk). Campground closed during winter season months. 1) All fees must be paid at the time of placing reservation. 1) Camping fees are determined by camp site location. 3) Camper units must use the designated gravel/concrete pads on sites 1 through 36. 4) One camping unit and one vehicle per site (maximum 6 people per/site). 5) No head-in parking unless tow vehicle remains attached to the camping unit. 6) Extra vehicles must be parked in designated overflow parking areas or visitors parking areas. 7) No parking on roadways, grass areas between sites or unused camping pads. 8) All fires restricted to ground grills. 9) No cutting or breaking off of standing live or dead trees/limbs for use as firewood. 10) No refunds made for early departures. 11) Quite hours are from 10:00pm to 7:00am – visitors must leave campground by 9:30 pm. 12) Vehicle access to campground is restricted to paid campers only. 13) Keg beer is not allowed in Madison County parks. 14) Juveniles (17 or younger) must be camping with a parent or legal guardian. 15) Tampering or attempting repairs to utility services is prohibited. 16) Emergency phone number: 515-462-3575 (Madison County Sheriff’s Office). All reservations are final. Refunds are not provided for cancellations or early departures. No refunds will be provided.